Now that the iPhone is conquering the mobile world … and the super-thin MacBook Air has made its debut … and the AppleTV has been updated into something useful … and the iPod line has been revamped for the future … and the Intel transition is long over … everybody wants to know what’s next for Apple. An eBook device? Doubtful, but that’s thinking too small. A Newton-like PDA? Doubtful, and PDAs are a dying product anyway. A tablet computer? Maybe, but they’re still too niche. An honest-to-goodness DVR/entertainment hub? Now we’re talking. The sleuths over at the AppleInsider today dug up another Apple patent, this one dealing again with a digital video recorder-like device. With it, users can browse for television programming, tune into TV channels, record programs, playback those shows, and download and manage content purchased at the iTunes Store. 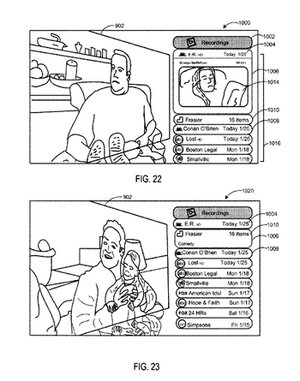 From the patent it also looks like Apple might integrate the iPhone and/or the iPods into the tightly-tightly controlled, almost choreographed user experience. Apple’s main product in the living room — the center of our digital entertainment worlds — is the limited AppleTV, which just received a much-needed, long-overdue overhaul in January. It’s now possible to download content, including movie rentals, from the iTunes Store directly to the set-top device, among other enhancements. While AppleTV Take 2 is an improved product, it falls short of its potential — for one, it still does not include recording or tuning capabilities. As a result, AppleTV languishes in mediocrity amid TiVo, cable and satellite DVRs and Video on Demand, Windows Media Center, super-strength game consoles like Sony’s PlayStation 3 and Microsoft’s Xbox, and many others. The void in the Apple ecosystem seems to be the living room, or some set-top box-like product that ties together and manages entertainment in the home. Apple arguably has the brains — the OS X operating system — and the brawn (computers, especially laptops) and key devices in the digital mix, namely the iPhone (mobile), iPods (audio and video), and the iTunes store (content). As with any patent filing by Apple, this one could be yet another smoke screen and never see the production line. But there’s something about this, whether it’s a completely new product or AppleTV Take 3, that seems … right. AppleInsider has considerable detail on the patent. Suffice to say, the patent shows a series of DVR interface screens with the look and feel of the AppleTV and OS X-like dock for on-screen control. It also includes an electronic programming guide (EPG) that’s not only for television but also for the iTunes Store. 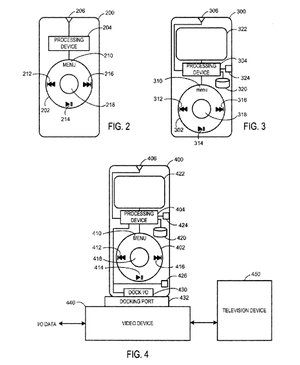 The patent also discusses a remote control not unlike an older iPod Nano. This remote plugs into the Apple product — whatever it is — and automatically downloads programming for viewing on the go. In the other direction, selections made in the mobile copy of the EPG ensures upcoming shows are recorded. Finally, the patent includes automatic wireless syncing, although it didn’t specify if this happens via Wi-Fi, Bluetooth, or some other near-field communications protocol. This kind of Holy Grail functionality has been on the drawing board for years but hasn’t been implemented, mostly likely because it’s impossible to tie together all sorts of products from dozens of manufacturers. But products from one manufacturer as sharply focused on the user experience as Apple, and it just might be possible. This could be the start of all our (Apple) devices — phones, music players, laptops, set-top boxes — syncing information and content automatically between each other without our continued involvement or being tethered to a computer. Like Amazon’s Kindle eBook reader, which has an as-of-yet, under-appreciated, always-on network presence, this kind of functionality is game-changing. And this Apple product — if it ever gets manufactured — might be the command and control center.